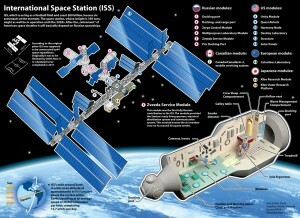 Home » General Interest » Where do the Space Station Astronauts get their Air? Where do the Space Station Astronauts get their Air? Astronauts first moved into the International Space Station in October 2000 and since then they have been supplied with oxygen created by a process discovered by the chemist William Nicholson over 200 years ago: electrolysis. Water is transported up from the Earth to the ISS, where a Russian-built unit, the Elektron, uses electricity from the station’s solar panels to split the water molecules into oxygen, which is fed into the station and hydrogen, which is expelled into space. To provide a safe, Earth-like, atmosphere and maintain a decent level of air pressure, the oxygen is combined with relatively inert nitrogen from on-board tanks. While the basic technology may be pre-Victorian, the ingenuity comes in squeezing the very last gasp of oxygen from the water: some 98% is recycled – right down to the tiny amounts of sweat and water vapour in the astronauts’ breath. In addition to Elektron, the ISS carries emergency sources of oxygen, including several months’ worth in tanks and over 100 lithium perchlorate candles, each of which, when lit, releases enough oxygen to keep an astronaut alive for a day.